•	IN YER FACE (In Yer Face Mix). 116 BPM. 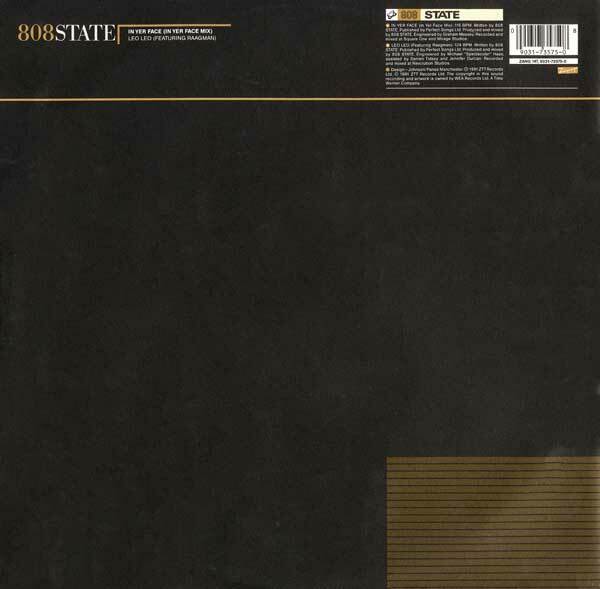 Written by 808 STATE. Published by Perfect Songs Ltd. Produced and mixed by 808 STATE. Engineered by Graham Massey. Recorded and mixed at Square One and Mirage Studios. •	LEO LEO (Featuring Raagman 124 BPM. Written by 808 STATE. Published by Perfect Songs Ltd. Produced and mixed by 808 STATE. Engineered by Michael "Spectacular" Haas. assisted by Darren Tidsey and Jennifer Durcan. Recorded and mixed at Revolution Studios. Design -Johnson/ Pannas Manchester. (p) 1991 ZTT Records Ltd. © 1991 ZTT Records Ltd. The copyright in this sound recording and artwork is owned by WEA Records Ltd. A Time Warner Company. IN YER FACE (Edit). Written by 808 STATE. Published by Perfect Songs Ltd. Produced and mixed by 808 STATE. Engineered by Graham Massey. Recorded and mixed at Square One and Mirage Studios. 2 LEO LEO (Featuring Raagman). (Edit). Written by 808 STATE. Published by Perfect Songs Ltd. Produced and mixed by 808 STATE. Engineered by Michael "Spectacular" Haas, assisted by Darren Tidsey and Jennifer Durcan. Recorded and mixed at Revolution Studios. Design - Johnson/Panas Manchester. (P) 1991 ZTT Records Ltd. © 1991 ZTT Records Ltd. The copyright in this sound recording and artwork is owned by WEA Records Ltd. Distributed by WEA Records Ltd. A Time Warner Company.